I haven't had the worst life in the world. In fact, all things considered, it's been pretty good. It started a little bumpy. I almost wasn't born. My parents split up before I was a twinkle in their eye and then they tried to reunite and well, they got me. There is a dispute over whether or not I was "wanted." And that's all I'll say about that. When I was about 4, my parents and my older brother joined the Church of Jesus Christ of Latter-Day Saints. I remember sitting on someone's lap and watching. I remember my daddy carrying me into church in a dress. When I was 5, there were big ugly fights, custody battles, bad adult behavior. And it ended with my brother and me being "illegally transported" out of the state. Although, at the time, it was not a Federal crime. My mother worked hard to make sure that it was in the future. As in now. So, I grew up without a mom. There was abuse before the split up and some after. Even though the adults thought I did not miss my mom, the fact is, I did. Maybe I missed being a family. Good or bad, it was my family. My dad was a good dad. I knew he loved me. He did his best. My brother, as tumultuous as it was to have an older brother; also loved me. He gave himself permission to beat up on me, but watch out if anyone else did! My Granny and my dear auntie Mo were there as back up moms. They taught me the feminine skills that I had when I left home. I am grateful for their influence. But, I came away from my childhood with a very keen poor self worth. I thought I was ugly and dumb and worthless. But, I had a happy personality and I got along. Those untruthful labels got a real beating, when at 19, my briefly renewed relationship with my mother ended tragically, at her own hand. I plunged into a quiet depression I am pretty sure most people weren't aware of. Maybe it wasn't depression. But I felt responsible for my mother's death and I was very sad for almost a full year. Fast forward through marriage, motherhood, lessons, successes, failures to a few years ago. I had found and learned and been applying a new tool. EFT. If you know me at all, you know I use it. 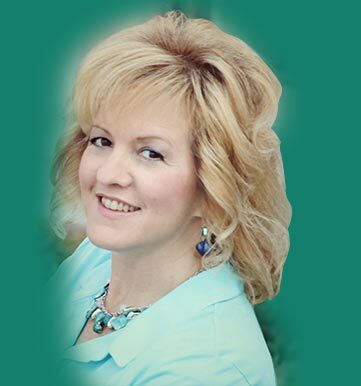 If you don't know what it is, just go to my EFT TAB, http://successrevolutions.com/what_is_eft/ I have no idea what I was working on, but I was using a book of affirmations to replace the negative with positive. I did not expect the one I came upon which not only stopped me in my tracks, but caused me to weep. "I am God's gift to the world." I immediately knew it was true, and my heart expanded at the knowledge. I pondered on it for quite some time before it really became a part of me. I thought about my Savior Jesus Christ. God gave His Son as a gift to the world. He created an amazing plan for all of us to return to Him and he put all of His effort into one solution. To save the world. I thought about that. I thought about the children I had been putting so much effort into to rear and train and eventually send out into the world. I thought how my efforts were a gift to the world, and how I desperately wanted each of my dear offspring to succeed; to become what they were meant to be; and to change the world in the ways they are meant to. It made perfect sense. God gave His only begotten Son for a purpose. And each of His other billions of children who came into the world are also a gift with a purpose; to bless the lives of others. It's kind of crazy, but it took me awhile to extrapolate my new found joy to others. I'm a little slow sometimes. So, on occasion, I had the opportunity to be at the right place and the right time, in someone's presence who needed the message I had found for myself. And I have shared with that person in that moment, that THEY are also God's gift to the world. It did not occur to me until last week at the Master of Influence seminar, as we were assigned to share "our" message, that this *IS* my message. To share with any who need or any I come in contact with, that they are each uniquely God's gift to the world. Have you ever considered that? YOU, right there, sitting in your chair or at your desk, YOU have unique gifts and talents given only to you, to change the lives of others in ways, that NO ONE ELSE CAN!!! Kirk Duncan told us at the seminar that inspiration minus expression equals depression. Wow! What an insight. How often do we have something to say and for whatever reason, we do not express it? How do YOU feel when that happens? Depressed is my guess. So, don't do it anymore! What is your message? Please don't hide your light under a bushel. Some of God's children have some pretty big missions, and gifts to share. Others may have humble, quiet messages. Either way, you do have a purpose, a mission, a message. How are you God's gift to the world? Only you can answer that. For God so loved the world, that He GAVE His (precious daughter/stalwart son) _______________ (insert your name), that whosoever (came in contact with) her/him, should have __________________ (fill in your purpose or mission). For God so loved the world, that He gave His precious daughter Dawn, that whosoever became acquainted with her, should know that they are God's gift to the world. OK. Now you know. And I promise to keep telling people, if you promise to do your part. 🙂 Blessings. One more thought as I reread this ready to share with someone else. I referenced John 3:16. I think verse 17 is every bit as important as 16. If you are LDS and have been a member of a choir for years, you can likely sing it. "For God sent not His Son, into the world to condemn the world (God sent not His Son into the world to condemn the world), but that the world through Him might be saved." What does that have to do with anything? I know human nature. I'm human. LOL. I can hear some saying, "well, a mission, a purpose, that's all fine for someone else, but you don't know how awful I am. I've committed this sin or this crime or I have this vice." And??? God's Son was not sent here to condemn you, but to save you. Enter the waters of baptism if you haven't, take His Sacrament weekly if you have. Listen for the word sanctify in the prayer and ponder that. I read this earlier today, and felt like it was engraved immediately deeply upon my heart. TOTAL. TRUTH. How do I know it is truth? First of all, in mind and heart, it simply feels so. I stopped everything. Read it several times. Pondered the truth of how it felt, and then tears came to my eyes. Then my mind went reeling backwards for evidence, in other things I have read and chosen to believe, and in my own experiences. Let's see where this post takes me. According to 1 John 4, God is love. God loves us. He wants us to love others. He is in us and we are in Him. If we do not love, we cannot know Him. It would follow that we also cannot know ourselves or others if we do not love. In other chapters of the New Testament we are invited to love our enemies and treat them with kindness even if they do not "deserve" it. Do any of us deserve God's love? No and yes. If we are to EARN God's love, we never truly can, and in that sense we do not deserve His love. We cannot do enough to earn it. But I am finally learning the lesson of the words I embraced years ago, "you are God's gift to the world" (as is everyone else) and realize as my new mentor Dave Blanchard teaches, that every single person has Intrinsic Worth. Intrinsic means, belonging to the essential nature or constitution of a thing. Our worth simply exists because God created us and loves us. It's easier to believe when we think of a baby. Most parents understand when a newborn is placed in their arms, that the value of the child, simply is. We simply love him or her, because she is, and she is our creation. She does not need to do anything for us to love her, she just needs to be. We are the same to God. We need not DO anything. We simply ARE His creation and He loves us. So, in that sense, yes, we deserve His love because He deems us worthy of it. Alternatively, most of us subconsciously feel that if our life is not perfect, or it is less than perfect, or it is really screwed up (our fault or not), that somehow we are completely responsible for it. If we are responsible for it, and even if we are not, we draw a conclusion that there must be something wrong with us. We must not have value. This creates a reason for us to hate ourselves. Blame ourselves. Demonize ourselves. Creat an enemy of ourselves. Where does this idea come from? The big E enemy. The enemy of God. The one who would have us hate ourselves. The one who would discourage us, throw us off course and keep us from our Divine brilliance. Why? The commandment is, love they neighbor as thyself. How can we begin to love our neighbor if we do not love ourselves? We cannot know God if we do not love (1 John 4:8), and we cannot love our neighbor if we do not love ourselves. So, if we do not love at all, we can never know God. 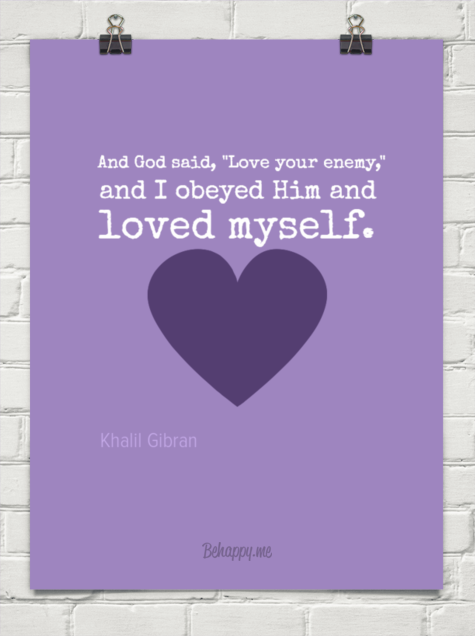 If we do not love ourselves, we cannot possibly truly love our neighbor. Therefore, God's plan is thwarted. If the real Enemy can convince us to hate ourselves, there is a good chance we will never be able to truly know and love God, or truly know and love our neighbor. If we cannot see our own Intrinsic Worth, we also will not see the Intrinsic Worth of others. It becomes so much easier then, to act out against, sin against, and refuse to be His hands in serving others and carrying out His greatest work of love: redemption. So, finally, when God commands us to love our enemy. 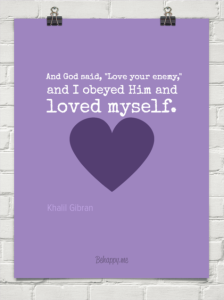 If we are our own enemy, and we love ourselves, we have defeated the plan of that other enemy, because we are now open to loving others and bringing about the true work of God. And that, is where my thoughts have taken me. Note: Why is a "spiritual" post on a success oriented page? Because every area of our being needs to be addressed. And the greatest success comes by accepting ourselves; loving ourselves. Love yourself. Achieve success.